View this sample resume for an assistant manager, or download the assistant manager resume template in Word. Does your resume act like your right hand, or do you wish you could rely on it a bit more? To be considered for top assistant manager jobs, resume expert Kim Isaacs says it helps to have a comprehensive resume. 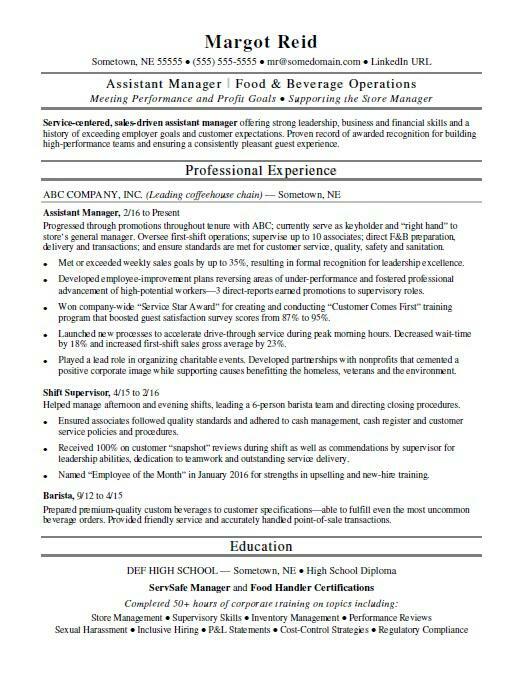 For resume writing tips, view this sample resume for an assistant manager (food service) that Isaacs created below, or download the assistant manager resume template in Word. When it comes to jobs for restaurant managers, they're projected to grow by 9% (or 27,600 jobs) from 2016 through 2026, according to the Bureau of Labor Statistics (BLS). You'll find the highest level of employment for this job in the following states: California, Florida, Texas, Tennessee, and Georgia; and in the following metropolitan areas: Los Angeles, New York City, Atlanta, Phoenix, and Anaheim. In terms of salaries, as a restaurant manager, you can expect to earn a median wage of $52,030 per year, or $25.02 per hour, according to the BLS. Additionally, you can search for assistant manager jobs on Monster. Service-centered, sales-driven assistant manager offering strong leadership, business and financial skills and a history of exceeding employer goals and customer expectations. Proven record of awarded recognition for building high-performance teams and ensuring a consistently pleasant guest experience. Progressed through promotions throughout tenure with ABC; currently serve as keyholder and “right hand” to store’s general manager. Oversee first-shift operations; supervise up to 10 associates; direct F&B preparation, delivery and transactions; and ensure standards are met for customer service, quality, safety and sanitation. Met or exceeded weekly sales goals by up to 35%, resulting in formal recognition for leadership excellence. Developed employee-improvement plans reversing areas of under-performance and fostered professional advancement of high-potential workers¾3 direct-reports earned promotions to supervisory roles. Won company-wide “Service Star Award” for creating and conducting “Customer Comes First” training program that boosted guest satisfaction survey scores from 87% to 95%. Launched new processes to accelerate drive-through service during peak morning hours. Decreased wait-time by 18% and increased first-shift sales gross average by 23%. Played a lead role in organizing charitable events. Developed partnerships with nonprofits that cemented a positive corporate image while supporting causes benefitting the homeless, veterans and the environment. Helped manage afternoon and evening shifts, leading a 6-person barista team and directing closing procedures. Ensured associates followed quality standards and adhered to cash management, cash register and customer service policies and procedures. Received 100% on customer “snapshot” reviews during shift as well as commendations by supervisor for leadership abilities, dedication to teamwork and outstanding service delivery. Named “Employee of the Month” in January 2016 for strengths in upselling and new-hire training. Prepared premium-quality custom beverages to customer specifications¾able to fulfill even the most uncommon beverage orders. Provided friendly service and accurately handled point-of-sale transactions. Once you input your skills and qualifications into this template, you want to be sure your resume stands apart from the competition's. Not sure how to make that happen? Get a free resume evaluation today from the experts at Monster's Resume Writing Service. You'll get detailed feedback in two business days, including a review of your resume's appearance and content, and a prediction of a recruiter's first impression. Let the experts at Monster take over some assistant duties and help you on your way to a great new job.